Capitol View’s checking accounts offer members reliable services and tools that make everyday banking easy. Checking accounts require an initial deposit of at least $25 and require no minimum balance. What’s more, our checking accounts require NO annual or monthly fee. Explore all of our convenient checking services. Capitol View offers a wide variety of paper check options including backgrounds, fonts, and special security features. Explore your check options, here. Contact Capitol View to place your first order or re-orders can be placed, here. *Seniors, age 60+ with an average Savings balance of $2,000 are eligible for free checks and free money orders (shipping and tax are not included). Ask a Capitol View staff person if you think you might qualify. Debit cards are available for most members with checking accounts. 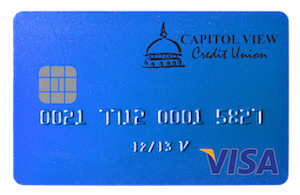 Capitol View debit cards feature EMV ‘chip’ technology (learn more below). In addition to everyday convenience, Capitol View offers complimentary fraud monitoring on all of our debit, reload, and credit cards. There is no annual fee or monthly service charge for our debit cards. Five ATM withdrawals and inquiries are offered FREE per month, and then are $1+tax each. View our rates & fee schedule for full details. Apply for a debit card now online or contact us for an application. 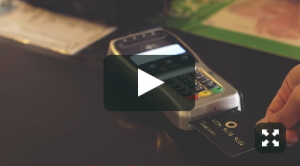 EMV ‘chip’ debit cards offer an embedded microchip, which offers powerful new security. This chip holds information that is encrypted, making it extremely difficult for the card to be copied or counterfeited. Rather than swiping your card, chip cards are inserted and held in a chip-enabled terminal to complete your transaction, this allows the terminal to communicate with the microchip. With the SHAZAM® BOLT$™ mobile app you’ll enjoy the convenience of mobile and the flexibility to manage your accounts wherever the road takes you. The app is enhanced with person-to-person (P2P) money transfers and an ATM location feature. In addition, SHAZAM BOLT$ provides fraud protection for your peace of mind; you can receive fraud alerts, check your account balance, and even place a temporary block on your debit card anywhere, anytime. Getting started is easy. Download the app, set your preferences and start keeping tabs on your account. The app will walk you through free enrollment. Reload cards are a great alternative to debit cards and do not require credit approval. 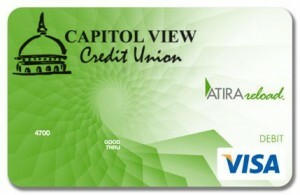 Capitol View’s reload cards allow members to load their cards with funds, without the card being linked to their account – a great security feature. In addition, we offer complimentary fraud monitoring on all of our debit, reload, and credit cards. Whether you are budget conscious, a frequent or world traveler, or want an easy way to avoid overdraft fees, a Capitol View reload card might be a great solution for you. Contact us to open your reload card today. Click here to download a detailed brochure on our reload cards. Already have a Reload Card? Access it online at www.atirareload.com to check balances, view activity, and load additional funds. Capitol View Credit Union is a partner in Shazam’s Privilege Status ATM program, which means as members you have surcharge-free access to all Privileged Statues ATMs. Look for the Privileged Status logo or search for a Privileged Status ATM near you, here.